Everyone’s excited about the upcoming 2020 Ford Bronco, in part, because of what the nameplate means to American culture: adventure, ruggedness, and fun. 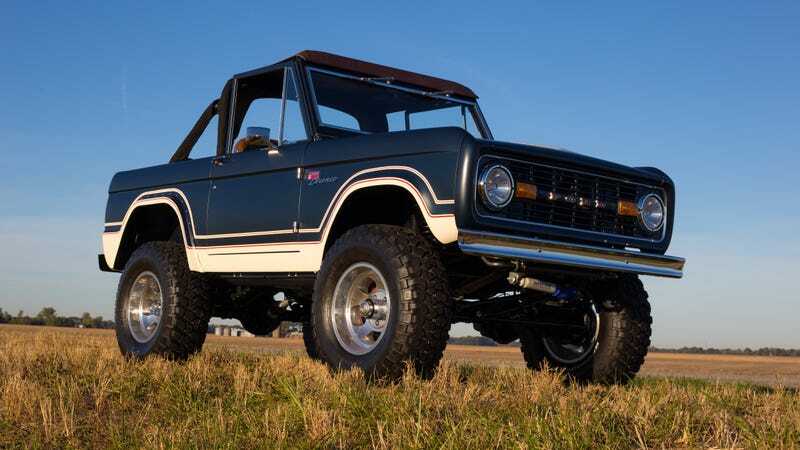 It was the first-gen model that created this meaning, so it’s cool that one Illinois company is now building those old Broncos from the ground up as a Ford-licensed product. But they’re not cheap. A company out of Illinois, Gateway Bronco has been finding pristine early Broncos and restomodding them for a couple of years now, getting its start in 2016. Recently, the outfit that “reimagines” Broncos announced that it’s the first builder officially licensed from Ford to create first-gen Ford Broncos from scratch, and also the first certified to recondition used Broncos according to Ford standards. CEO and President Seth Burgett told me over the phone that his company offers three main types of Bronco builds: originals that have been restored, new bodies on original frames with VINs and titles, and new Broncos from the ground up including both a new frame and body. And on that front, Gateway Bronco says it’s using 5.0-liter Coyotes as its primary power plants, with plenty of bolt-on options, like twin turbos, a Borla fuel injection system, or even a Shelby supercharger. The frame, Burgett told me, comes from a subcontractor, and either comes to Gateway’s Illinois facility complete, or as just the rails. That frame can be modified, Burgett told me, to facilitate either a solid front axle or an independent suspension setup. Gateway’s website shows three main models ranging in price from $120,000 to $180,000, and offering both automatic or manual options, and warranties as long as five years. I don’t know much about Gateway as a company, but I do know that the Broncos in these pictures look lovely, and if they’ve got Ford’s stamp of approval and a warranty, that also sounds lovely, even if the price tag doesn’t.